The very act of building a home was human's way of defying nature. It home meant that a human's family had a safe place to live, protected from the weather, wild animals, and even other people who might do his family harm. Eventually, home builders began decorating the home to make it more attractive and comfortable. One way to decorate the outside of a home is with a garden. A garden is a planned space to display elements of nature, especially plants. Like building the home, creating a garden is a way to tame nature, but a successful gardener almost always discovers that they need to work with nature and not against her. Most gardens make use of plants, usually for decoration but occasionally "useful" plants like fruits and vegetables turn up in a garden setting. The defining difference between a vegetable garden and a farm crop is mostly scale but the intent is also important to the difference; farming is done for survival while gardening is for pleasure. There are different kinds of gardens, depending on the desires of the gardener. In Great Britain, the term garden refers to an enclosed space of land, usually adjoining a building or home. This would be a yard in American English, while the American garden refers to the space for cultivated plants. A simple flower garden might be a patch of tilled earth where a few colorful flowers from the hardware store are planted each spring, while a vegetable garden might require a greater amount of planning and attention to yield an appreciable harvest. Many homeowners desire a formal garden. These can be extensive, which beautiful flowers and hedges arranged in a way to provide private spots for conversation on contemplation. A formal garden is also the obvious setting for a garden party. About all a formal garden party has in common with a backyard barbeque is that a rainstorm can ruin the whole affair. Being an affair for the upper crust, a garden party has the potential for intrigue and romance, as Mary Noble discovers on Backstage Wife. When Fibber shows up at the Whitney's garden party, any hope of formality disappears on Fibber McGee and Molly. A formal garden might be the intent on Blondie, but when Dagwood gets a truckload of seeds for $25, who knows what the result will be. 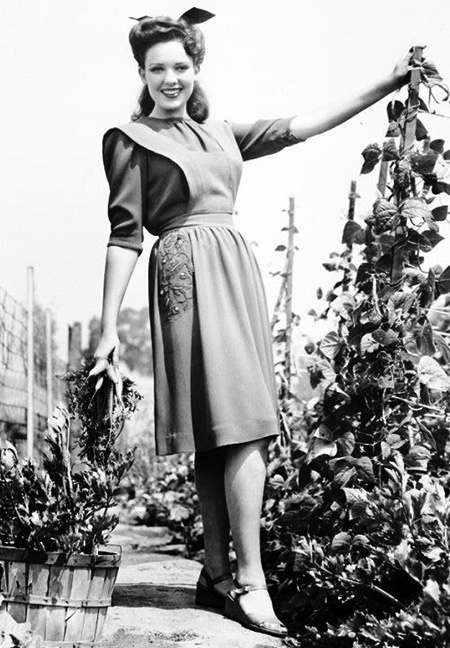 During the World Wars, citizens were encouraged to cultivate Victory Gardens. The idea was to offset the necessity of rationing by encouraging people to grow some of their own food. This is a little ironic because most rationed items were ones that could not be grown in a garden, but the boost to civilian morale was immense if for no other reason than figuring out how to make your Victory Garden grow took one's mind off the War for a while. Richardson Wright, chairman of the National Victory Garden Committee appeared on the quiz show Double or Nothing to pitch the program, while Red Skelton and Bob Burns used their programs as a forum to lament their lack of success with their Victory Gardens. On The Burns and Allen Program, George encourages Gracie to start a Victory Garden when he explains rationing on a program when the sponsor had a premium offering gladiolus bulbs. Leroy starts his own Victory Garden on The Great Gildersleeve when his door-to-door seed selling business fails. Summerfield's dedicated Water Commissioner gets bit by the gardening bug after a run in with the Green Thumb Flower and Garden Club, and on another occasion, Gildersleeve decides to make his yard as attractive as Bullard's without realizing the amount of work involved (somehow, manure and Gildy just seem to go together.) Another surprising gardener is Jack Benny, who takes up gardening on The Jell-O Program in 1937, and brags about it in a 1940 episode. It was not much of a stretch for the horror host of Inner Sanctum Mysteries to twist something as sunny and innocent as gardening into something evil. After all, digging a grave could easily be mistaken for planting flowers. A "devil's garden" refers to the earth moved for a secret, hidden grave, and is a device used on Escape and Suspense. Probably the best thing about gardening is that it is a relatively quiet, contemplative activity that can be enjoyed while listening to Old Time Radio programs. Be the first to comment on "Gardening"